Scottish trio Biffy Clyro made the jump from cult heroes to mainstream rock titans with 2007's breakthrough album Puzzle. Amidst a whirlwind of touring that saw the Biffy boys wow festival crowds the world over and open for Muse, Bon Jovi and Queens Of The Stone Age in stadiums, singer/guitarist Simon Neil's Peavey Delta Blues combos remained an vital ingredient in his wall of sound. 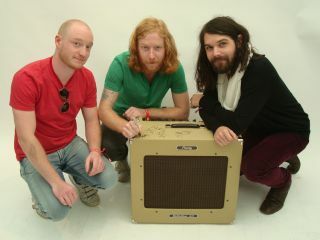 Up for grabs in this exclusive MusicRadar competition is a Peavey Classic Series Delta Blues 210 combo worth £569 and signed by Biffy Clyro frontman Simon Neil, bassist James Johnston and drummer Ben Johnston. Enter the competition straight away!